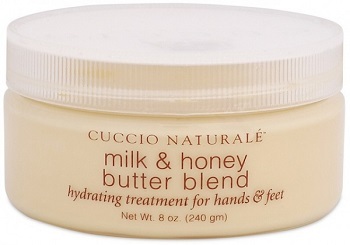 Home > Lotions & Butters for Hands, Body, Feet > Cuccio Naturale Butter Blend Treatment 8 oz. Cuccio Naturale Butter Blend Treatment 8 oz. Cuccio Naturale Butter Blend, Hydrating Treatment for Hands & Feet in 8 oz. jar. It comes in five scents of Lemongrass & Lavender, Milk & Honey, Papaya & Guava, Pomegranate and Tuscan Citrus Herb. To use: Apply to hands, feet or any other areas of the body that need extra moisture and hydration.